At sometime around 2.45am this morning [Apr 13] a fire broke out at a residence in the Border Lane and Palmetto Road area, sending flames and smoke leaping into the night sky. The Bermuda Fire & Rescue Service responded, and as of this writing are working to bring the fire under control. Update 3.30am: The fire seems to be getting brought under control now, with flames no longer visible. Update 3.52am: Police Media Manager Dwayne Caines said, “First responders attended a report of a partial house collapse and fire that took place at a dwelling on Border Lane and Palmetto Road in Pembroke at 2:40am. “It appears that the occupants of the home were awoken to the sounds of what they are describing as a loud explosion. “All of the residents [three apartment residence] managed to escape serious harm before a portion of the structure was engulfed in flames‎. 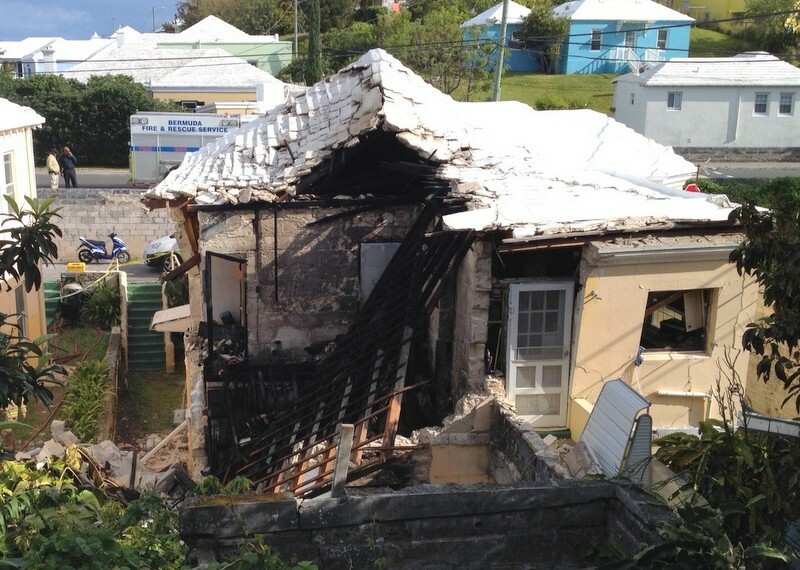 “The Bermuda Fire Service responded with two appliances and 14 fire personnel and an investigation into the cause of the fire is underway,” Mr. Caines added. Update 5.26am: The video below contains statements from Bermuda Fire & Rescue Service’s Dana Lovell and Bermuda Police Service Inspector Andy Morgan. Mr. Lovell said there were no reported injuries, and that it is too early at this time to determine the cause of the fire. Firefighters from all three stations [Hamilton, Clearwater, Port Royal] attended the scene. Update 12pm: A photo showing the damage, in clear daylight is below. Update 12.14pm: MP Michael Weeks, who represents the area, traveled to the property to extend his support to the family who live there. He said he was told one person was at the hospital. Audio of his comments are below. Update 1.28pm: Fire Service spokesperson Lieutenant Leonard Davis said, “The Bermuda Fire and Rescue Service responded with 9 fire appliances staffed with 20 firefighters. Lieutenant Colin Swan of the Operations Division said, “On our arrival we could see smoke and flames bellowing through the roof. Firefighters dressed in self-contained breathing apparatus and equipped with two 1 ½” hose lines immediately gained entry into the premises. Fire investigators were called to the scene to investigate the cause of the fire. The fire is currently under investigation. Update 6.53pm: Police Media Manager Dwayne Caines said, “The Palmetto Road was opened to vehicular traffic in the early hours of this morning and the Bermuda Fire Service have released the scene. How on earth did Bernews get there so quickly…(nothing disrespectful intended). Seriously though, glad everyone seems to be okay, though no doubt in a touch of shock. Why the eff does it matter how fast Bernews got there? The cover the news – and we’re always grateful! Relax! They were just making an observation. I’ve often wondered the same thing myself! RU Kidding needs to stay off the kool aid! Bernews always gets there quick buh!!! Glad to hear everyone is okay. Good job Bermuda Fire Service. As for Bernews, l must commend then as they always seem to be spot on with their reporting. Never and l say never have we had such instant news reporting n up to date reports such as the service rendered by Bernews. Surely, the other news agencies can take huge hints and accreditation from the service that is presented to the public by Bernews. So glad that everyone got out safely and the Fire Service responded within minutes. Bernews, please keep us posted as I’m sure that many people will want to help. I imagine that the people who lived in these three apartments have lost literally everything as they ran for their lives with only the pajamas on their backs. So sorry for these poor folks who lost their home, but glad their lives were spared. I cant imagine the thought of my home, my sanctuary from the world, catching on fire. Good job once again to BFS and BPS, and great updates as usual from Bernews. When you are asleep Bernews is up, out and around collecting and getting news ready for when you wake up. Congrats to Bernews for all their good work. There was one person hurt in the fire. she is in intensive care with burns to the face and hands.